Teachers are all looking for ways to meet our students’ needs. Today’s teaching requires integrating more feedback, more higher-order thinking, more technology, as well as a way to demonstrate alignment to current standards. My search took me to TenMarks Math. I wanted rigorous online questions so that my students could practice answering on technological devices. For two years, at two different high schools, I used TenMarks Math assignments for practice and as assessments. With a clear, easy-to-use standards alignment, TenMarks provided me with data to support my students’ needs in ways no tool or textbook had. My students got instant, complete feedback, while I had more time to tailor curriculum and better data to do it with. What a win-win! While TenMarks Math Free was super, a couple of limitations nagged at me. Every assignment has embedded supports, like hints and videos. These are great for assignments, but they don’t create an authentic assessment experience. I also wanted a separate question bank for tests. Delving into TenMarks Math Premium made it clear that I could have everything I wanted and an additional benefit of being able to push out personal work through automatic differentiation recommendations. Data-driven, teacher-friendly customization won me over. Finally, a product that helps me be a better teacher and gives me more time to spend with my students! So, I found the product I wanted and the product my students needed, now what? This is bigger than asking your department to order pencils. District-level decision makers need to be involved. So, here are the steps I took to have a meaningful conversation with, and ultimately bring TenMarks Math Premium to, my district. See something great? Share it with your coworkers! 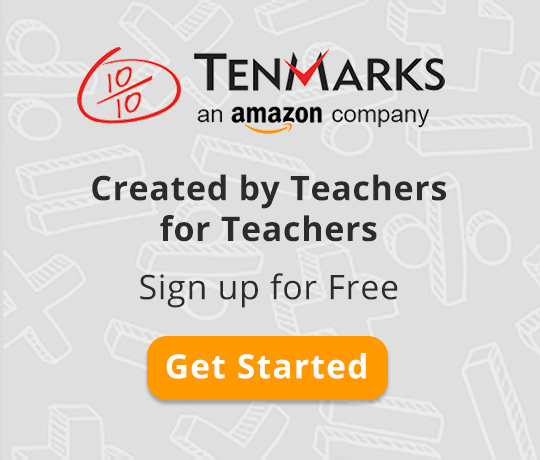 I encouraged other teachers in my department to check out TenMarks Math Free Trial. Approaching administrators about the premium version flows better if a group of teachers in the district can speak to and are familiar with the benefits of the program. I helped teachers get started by loading their class roster and creating their first assignment with them. I also did a couple of demos in our math department meetings. While this took a bit of time, everyone got over the set-up hurdle. In a couple of weeks between the content and the data, we were all hooked. With my department head and my teaching partner on board, we went straight up the chain-of-command. Our next step was to approach our principals and our head of curriculum. At every level, my district is striving for student success. So, when nerves set in about asking for the premium version, I asked myself, “Do I believe that this is the best for my students?” The resounding “Yes!” in my head got me through. Every district wants to allocate resources on programs that work. So, showing the impact of TenMarks Math on my students through data was essential. My teaching partner and I spoke to the growth we saw in our students’ scores on the Northwest Evaluation Association (NWEA) assessments. Also, the failure rate dropped dramatically in our Algebra 1 classes. We explained that a huge contributing factor was the work students did on TenMarks Math. We stressed that TenMarks Math is not a “babysitter program.” In contrast, TenMarks Math puts teachers at the center and, to get the most out of the program, teachers must be highly involved. TenMarks Math Premium wouldn’t replace us, but rather, allow us to be better teachers using real-time, improved data to meet our students’ needs. Our conversations with administration really resonated. In particular, the immediacy of feedback for students and teachers stood out. We could clearly show the potential gains for student support from teachers having access to real-time data to inform instruction and fill gaps. They asked if we could have someone from TenMarks visit and talk about the product. From there, the conversation was easy. Now, our district is reaping the benefits of TenMarks Math Premium. The administrators, teachers, and students are all delighted with our decision. Do you have any additional tips to get your district leaders excited about using the premium version of TenMarks Math? Share your thoughts in the comment section. Best of luck to you and your colleagues as you work to bring TenMarks Math Premium to your district! To contact sales for more information, fill out this form. Susan Mattingly is a Mathematics teacher at Lincoln Park High School in Lincoln Park, Michigan. She teaches students in grades 9-12, writes district curriculum, and coaches colleagues in instructional strategies. She also serves as an Amazon Education Fellow, helping to bring best practices for using TenMarks Math to her district.